Historically, a build vs. buy analysis was focused on on-premises vs. cloud. As cloud-based software services and data analytics tools have increased in popularity, the value that cloud services provides is fairly well understood. However, understanding the tradeoffs between different cloud data warehouse tools is much less understood. What if you were evaluating different cloud-based data warehouse options? Wouldn’t you want to make a smart choice from the panoply of options that makes the most sense for your business? 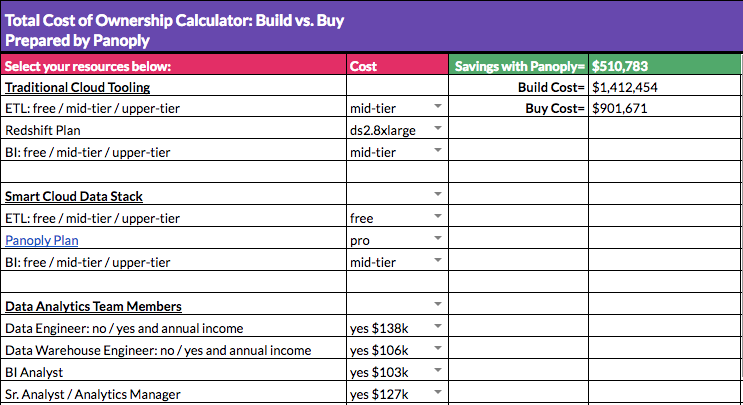 We’ve all felt the pain and understand the need for data-based answers, so we created a simple, lightweight build vs. buy, total cost of ownership calculator (click and request access) that you can use to determine if you should build and maintain your own cloud data warehouse solutions, or use an off-the-shelf managed service like Panoply for your cloud data warehousing needs. If you need data from multiple sources, chances are you’ll need to extract, transform and load it to your data warehouse. Most data analysts depend on data engineers to build or manage this process for them. The tooling comes in roughly three price points—free (open source), mid-tier, and upper-tier. There are trade-offs at each price point, and if you choose to use open source tooling, make sure you budget for a data engineer! The point of data going in is to be able to quickly make decisions, generally with the visualizations generated by your BI tool. Again, The tooling comes in roughly three price points—free (open source), mid-tier, and upper-tier. Choosing a free tool requires more hands-on maintenance, and this calculator accounts for this. Redshift is one of the most common data warehouse providers, offering a cloud data warehouse at various price points. 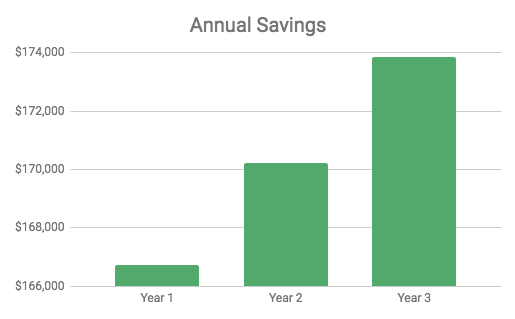 Select a plan based on your requirements and the amount of data you need to store, and you’ll instantly be able to compare how your savings shift when compared to Panoply’s pricing plans. Depending on your tooling, you’ll need at least one data analyst and maybe a data engineer. If you decide you build and maintain your own data stack, you’ll definitely need a data engineer, if not two or more. Then you’ll need to account for a data analyst or two to manage the BI as well as to depend on for analytics. The cost of human capital varies widely, so we pulled data from Glassdoor across 16 major metropolitan areas to find a low, mid and high salary range. These numbers are intended to be representative of the cost of headcount. Benefits were not included, as these can vary widely across markets and industries. Managed services are a no-brainer for those who are working with a lean team. If you’re considering building and maintaining internal analytics tools, run a quick analysis with the total cost of ownership calculator for data warehouses (click to request access). You might be surprised by what you find as you create your own data warehouse cost estimation!